Creating an engaged workforce is critical to business success. Engaged employees positively impact retention, absenteeism, productivity, customer ratings, profitability, and many other business outcomes – as outlined by Gallup. Sadly, only 32% of U.S. employees are engaged – meaning they are “involved in, enthusiastic about and committed to their work and workplace.” And the numbers are even worse beyond our borders, with engagement standing at a mere 13% worldwide! While leading organizations are aware of the problem and are actively seeking solutions, many are not seeing a good return on their engagement investments. As customer training manager at Achievers, I often work with organizations who are excited and committed to improving employee engagement, but they don’t really know where to start. I think part of the problem can be solved by clarifying who’s responsible for improving day-to-day employee engagement. While I completely agree that HR is responsible for managing many of the programs and practices that impact and measure engagement, we can’t stop there. So who exactly has the greatest potential to influence day-to-day employee engagement in our organizations? Leaders. Leaders at all levels, especially at a senior level, have an obligation and a responsibility to drive employee and business success by becoming engagement champions. It is a commonly accepted business truism that people leave managers, not companies. Managers are the people that employees must interface with on a daily basis and with whom they have their most meaningful and impactful interactions with (both positive and negative). Because of the outsized impact they have on employee engagement, leaders and managers must learn what levers to pull in order to foster engagement on their teams. It has been found that one of the most effective ways to drive engagement is through recognition. In fact, when asked what leaders could do more of to improve engagement, 58% of respondents to a recent survey replied “give recognition.” But employee recognition is just one piece of the employee engagement puzzle, albeit an extremely important one. What else can leaders do to help them become an engagement champion? 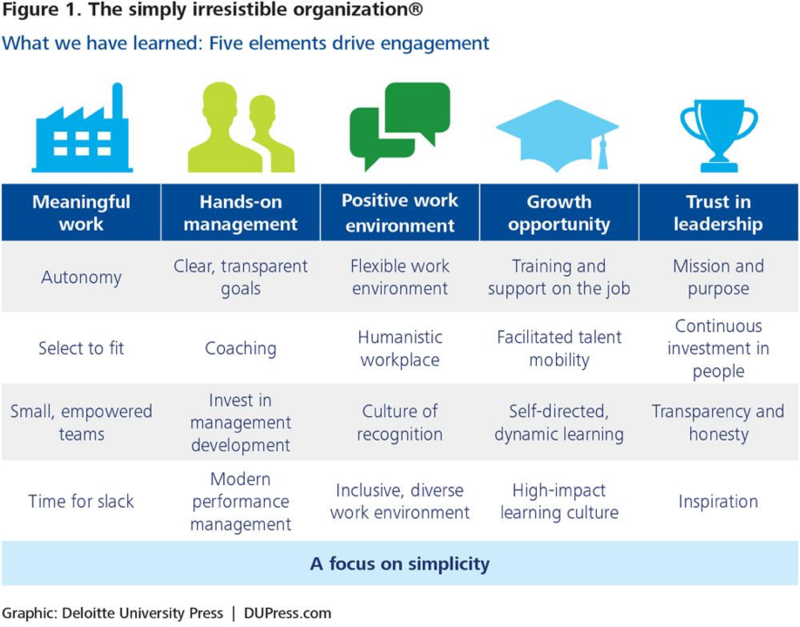 Josh Bersin’s Simply Irresistible Organization model highlights five elements that drive employee engagement, and I believe leaders should use this as a guide in their role as engagement champions. Employing Josh Bersin’s Simply Irresistible Organization model and embracing employee recognition is a great place to start for leaders hoping to become engagement champions. [Josh presented the Simply Irresistible Organization model at the Achievers Customer Experience (ACE) conference back in 2014. You can watch his full presentation here if you’d like to learn more.] But how can organizations help accelerate their leadership’s path to becoming engagement champions? To begin with, they can use the following strategies to coach, develop, and support them on their journey. Leaders need to be equipped with the knowledge and skills to drive employee engagement. Training should focus on why it’s important, how it can benefit them in their roles, and what they can do to improve engagement. This could take the form of short videos, bite-sized eLearning courses, formalized training sessions, intuitive reference materials, or other ways you train leaders. Leverage the expertise of your L&D team and align any training with their initiatives and programs. Since leaders are often busy people, they need to be reminded on a regular basis of practical tips for engaging their team. The model above provides a starting point, but regular communications can help to reinforce what you expect of leaders and the ways in which you are supporting them, including: training, technology and mentorship. As Deloitte points out, “people are overwhelmed with the volume and always-on nature of messages, email, information, and work related activities,” so it’s important that engagement tools are easy to use for employees and leaders alike. Leaders need tools to frequently measure engagement, provide actionable insights, and support their engagement efforts. When considering who to partner with to support your engagement initiatives, there are many to things to consider. First, you need to identify your needs. Many current software solutions focus on only one aspect of employee engagement, such as recognition or pulse surveys. Others, like Achievers, offer a more complete engagement solution. One that enables social and points-based recognition, results-based incentive campaigns, wellness initiatives, innovation programs, pulse surveys, actionable insights, and more. Next, you should consider what you want the employee, leader, and administrator experience to be with your software solution. The Achievers platform is designed to be an intuitive experience for all users, regardless of what device it’s accessed on. Finally, you should consider only those providers who will be a true partner on your engagement journey. Since its founding in 2002, Achievers has partnered with hundreds of organizations to improve employee engagement and positively impact business results. By clarifying who’s ultimately responsible for day-to-day employee engagement and empowering leaders to become engagement champions, organizations can create an engaged workforce and see business success. To learn more about how to become an engagement champion, download Engage or Die: How Companies That Act Fast on Engagement Outpace the Competition. Mike Vickers joined Achievers in January 2014 to lead customer training and education. He has spent over six years designing and implementing learning and performance strategies for organizations of all sizes. Mike is passionate about transforming organizations through effective learning solutions, innovative technology platforms, and modern HR practices. Connect with Mike on Twitter (@MikeVickers) or LinkedIn. Thanks for reading Romano! 🙂 We completely agree. Recognition is a need, not a want. Happy New Year!